Maria Hatzistefanis went from bootstrapping Rodial Group in a back room to turning it into a £16m turnover business. Despite a great deal of scepticism about the effect ‘age-defying’ treatments and wrinkle zapping lotions have, plenty of people are willing to splash the cash on them - the UK beauty industry’s worth around £20bn alone. But when Maria Hatzistefanis founded skincare brand Rodial back in 1999, she claims there was a clear gap for something that effectively offered an alternative to cosmetic surgery. She started from a back room in her house and Hatzistefanis funded the business with her own savings. She's never taken on external investors and while the lack of external funding made it difficult to get the business going, it did help keep the firm lean. Sales of Rodial Group’s three brands, Rodial, Nip+Fab and Nip+Man – hit £16m last year and next year’s target is £25m. Hatzistefanis now employs over a hundred people. It took her five years (and a frequent stream of phone calls) to get Rodial into Harvey Nichols and another two years to get it stocked in Space.NK. ‘I always knew I wanted to be in luxury beauty, but I never imagined I could have the same in New York, LA and Hong Kong,’ she says. It’s now available in 35 countries and over 20,000 stores worldwide. 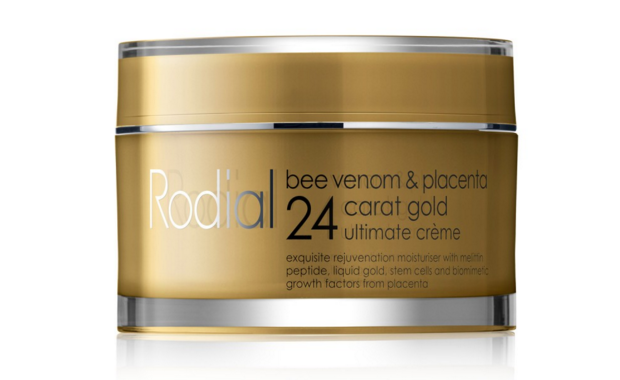 In the past, much has been made of Rodial’s unusually named and some astonishingly priced products – a tub of Bee Venom and Placenta (yes, really) 24 Carat Gold Ultimate Crème will set you back £750. Apparently the venom is used to trick the skin into thinking it has been lightly stung and apparently causes the body to direct blood towards the area, stimulating the production of collagen and elastin. There’s also a Dragon’s Blood range and Snake serum – the first product to stir up controversy. A campaign was filmed featuring snakes coiled around the product. Their main ingredient is ‘a synthetic venom’ called syn-ake which apparently performs in a similar way to viper venom – when a snake bites it can paralyse the muscles. Which might sound horrific to some, but proved a draw to others. ‘Some people were turned off by the name, but at the end of the day not having an advertising budget we needed to do something different to get the brand attention and create buzz,’ says Hatzistefanis. PR has been a priority right from the start and she didn’t have the tool of social media. ‘I had to go the traditional route of connecting with press, sending goodie bags and getting products into the hands of influencers and celebrities to grow brand awareness,’ Hatzistefanis adds. As time went on and media habits changed, it’s become something of a necessity for businesses to embrace social or risk getting left behind. Hatzistefanis has her own Mrs Rodial YouTube account – though she admits despite creating it in 2005 she didn’t take it seriously until last year. Reality TV star Kylie Jenner is a ‘brand ambassador’ for the mass market Nip+Fab brand – essentially serving as its face, featuring in ads for the products and discussing her favourites (the Dragon’s Blood serum) online. That provides Rodial access to an audience of 15 million Twitter followers and 55 million Instagram followers. Hatzistefanis has also branched out from skincare into makeup, with a flagship counter and sculpting bar in Knightsbridge, offering women an introduction to contouring (a makeup technique favoured by Jenner and the other Kardashian sisters). She thinks it’s been crucial having this physical presence even with the rise of ecommerce. ‘Everything is moving to the digital world and we’re growing our web presence, but at the same time you want a place for the customer to physically try products and get that luxury experience,’ she explains. One group of consumers that has been particularly difficult to entice is men. Rodial’s Nip+Man collection was launched in 2013 and although sales have been growing, Hatzistefanis says ‘it’s a harder market to crack’. Products include the Bicep Fix and Ab Fix, as well as the dubiously named Manotox moisturiser - a Botox alternative for men. ‘I don’t think we have it right yet,’ she admits. ‘Men are hard to get to change – I think they use the same moisturiser from when they start using it to the day they die! Whereas women are a lot more experimental.’ And there are plenty who don’t use it at all. So Hatzistefanis has improving that on her to-do list, along with a longer-term effort to take Rodial further into Asia. Maria Hatzistefanis is an O2 Business ambassador, supporting Business Essentials – a flexible tariff for small businesses.